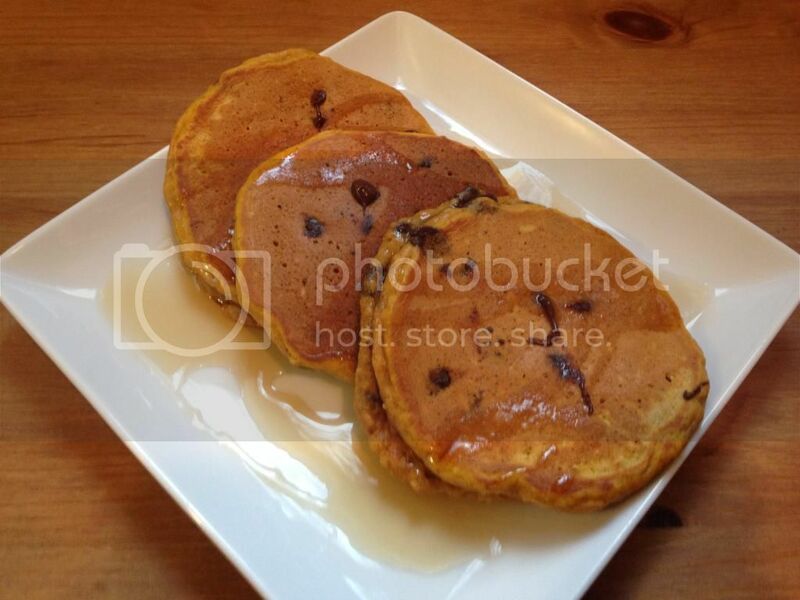 TheFishie's Kitchen and Home: Pumpkin Oatmeal Pancakes with Chocolate Chips! 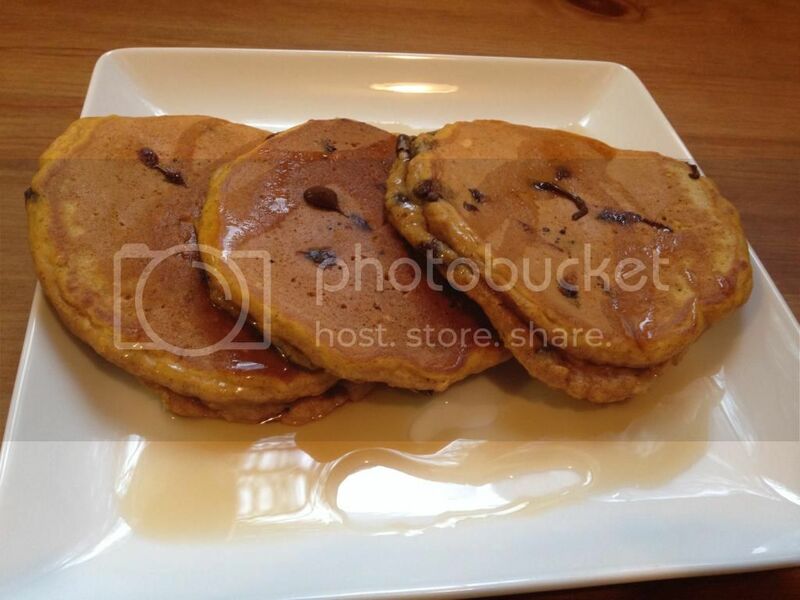 Pumpkin Oatmeal Pancakes with Chocolate Chips! It's fall and I'm in a pumpkin mood. That's not a super extraordinary thing to say this time of year, I know, but it is rather for me since I'm not a big pumpkin lover. I typically enjoy baking or cooking with pumpkin when it's something I know I'll be able to give away or feed to someone else. However, I've honestly been enjoying my endeavors this fall. Thus far, I've made pumpkin raviolis using my butternut squash ravioli recipe and this tasty pumpkin oat bread. The raviolis were a happy accident as I though I had pulled a bag of frozen butternut squash from the freezer only to find out it was pumpkin after it was defrosted. I think there are pictures of the bread somewhere, but they may have been misplaced in my mad dash to clear memory space for our trip to Hawaii. Anyway, today's breakfast was a hit. I slightly adapted a recipe from Cooking Classy to make it a bit healthier by using white whole wheat flour. I also made a third of the recipe without chocolate chips (and fed those to my two year old who gets quite enough sugar as it is :). Finally, I used King Arthur's dried buttermilk powder as I didn't have any fresh buttermilk on hand. I love that stuff as it makes cooking with buttermilk something I can do on a whim. Preheat griddle to 350 degrees. In a large bowl, whisk together flours, oats, sugar, baking powder, baking soda, salt, spices and dried buttermilk powder (if using). In a separate bowl, combine eggs, pumpkin puree, vanilla, canola oil, buttermilk or water. Slowly add wet to dry until well combined. (Do not overmix.) Stir in chips. Spray or butter griddle. Pour batter in 1/3 cupfuls and cook a few minutes on each side until golden brown and cooked through.